k’awat’si Construction is making significant progress in the home stretch of construction for Kwa’lilas Hotel! Drywall in all guestrooms was completed last week, followed by painting, furniture assembly and bathroom tile installation this week. The lobby drywall has also started this week. The cedar siding is fully complete on the North Building, and the South Building is being prepared for restructuring of the lifted ceiling. The South Building windows arrived this week and are being installed. Upon installation, it will be finished with cedar siding to match the North Building. Millwork, such as moldings, door and window frames, has started on the second and third floors while rooms on the third floor at Kwa’lilas Hotel are getting dressed up! Furniture is being set up in guest rooms, and bathroom tiles were also being laid in those rooms this week. The second floor will go through the same process next week. The first shipment of artwork arrived last week, and the unique art pieces are being installed this week. These include features at the front desk, as well as a headboard designed by Walter Brown. We’re thrilled to see these major pieces coming together to reflect the visions of our designers and artists! 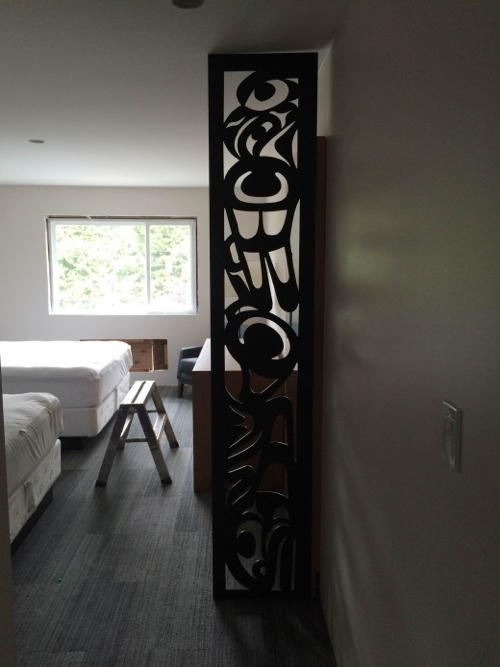 Furniture is being set up in guestrooms on the third floor at Kwa’lilas Hotel with featured room divider designed by Walter Brown.